Measuring approximately 10.5 inches high, this handmade Turkish lantern adds ambiance & a warm glow to any environment. 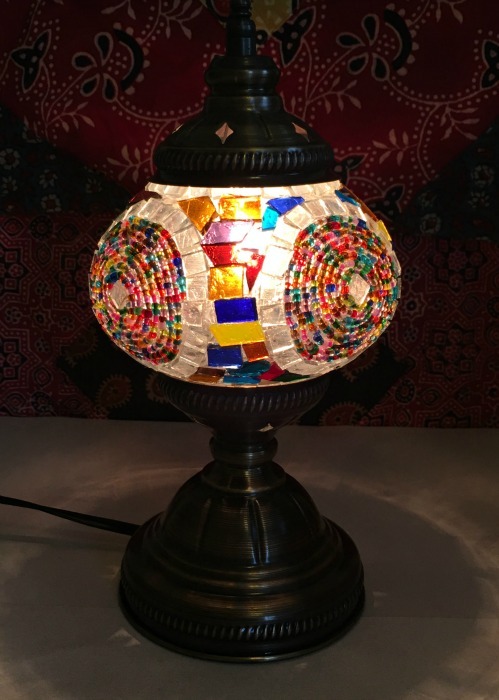 Brass base is approximately 4.5 inches wide, mosaic globe is 5 inches & has a cord extending 7 feet for a variety of placement options. Takes a standard chandelier bulb of 7 watts. Toggle off/on switch. Please keep in mind the uniqueness of this lamp. Imperfections are part of the overall design & lend a special distinctiveness. In order to get your lamp to you safely, please choose UPS as your shipping option! We cannot ship the Turkish Lanterns via the U.S. Postal Service.